Jerome Allen “Jerry” Seinfeld was born on April 29, 1954. He is an American comedian, actor and writer, whose style is typically described as observational comedy. 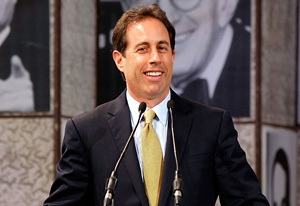 In addition to being a stand-up comedian, he is perhaps more popularly known for playing a semi-fictional version of himself in the situation comedy Seinfeld that ran from 1989 to 1998. He co-created and co-wrote the show and by the show’s final two seasons he became the co-executive producer. Since Seinfeld he has co-wrote and co-produced the film Bee Movie and also played the lead role of Barry B. Benson. In February 2009, it was announced that Jerry Seinfeld will be a part of a new reality TV series called Marriage Ref on NBC. It has been rumoured that Seinfeld will work behind the scenes, primarily as creator and executive producer, however it is also said that he may make cameo appearances. Seinfeld is also planning to guest star on episodes of the Starz Original series, Head Case. It was also announced in March 2009 that Seinfeld along with the entire cast from Seinfeld will make an appearance on Larry David’s HBO original series Curb Your Enthusiasm. He was born in Brooklyn, New York. His father, Kálmán, was of Hungarian Jewish background and was the owner of a sign making company. His mother, Betty, is of Syrian Jewish descent. He grew up in Massapequa, New York; in September 1959. His mother, Betty enrolled him at Eastlake Elementary School. He then went to Massapequa High School. For a brief period during his sixteenth year he volunteered in Kibbutz Sa’ar, in Israel. He attended SUNY Oswego, and after his sophomore year he transferred and then graduated from Queens College, City University of New York with a degree in communications and theatre. He soon took a liking to stand-up comedy after performing stand-up in college productions. Directly after graduation from Queens College, he performed at an open mic night at New York City’s Catch a Rising Star in 1976. Shortly after, he made an appearance in a Rodney Dangerfield HBO special. Seinfeld got a minor recurring role as “Frankie”, a mail delivery boy who liked to perform comedy routines against the will of others, on the Benson sitcom in 1979. However he was quickly fired from the show because of what was said to be creative differences. Seinfeld has mentioned that he was not formerly fired but realized that his role had been scrapped when he went on set and saw that he had no part in the script. Seinfeld appeared on The Tonight Show Starring Johnny Carson around May 1981, he had undoubtedly impressed Carson and the audience, which resulted in his further appearances on the show. He also appeared on other shows including Late Night with David Letterman and The Merv Griffin Show. Seinfeld is married to Jessica Skla they have three children, one daughter and two sons. Their daughter Sascha was born on November 7, 2000 in New York City, son Julian Kal was born on March 1, 2003 York City, and Shepherd Kellen was born on August 22, 2005 at New York’s Cornell Medical Center.